Heat a large skillet over medium heat, and add olive oil – once shimmering, saute the onions until just turning golden. Stir in the garlic and chilies in adobo sauce. Saute for a few minutes more, and transfer to a food processor. Blend until the texture resembles a paste; set aside. Reheat the skillet and add oil – pour in the ground turkey, and use your spoon to chop the meat into chunks. Allow to cook until browned. 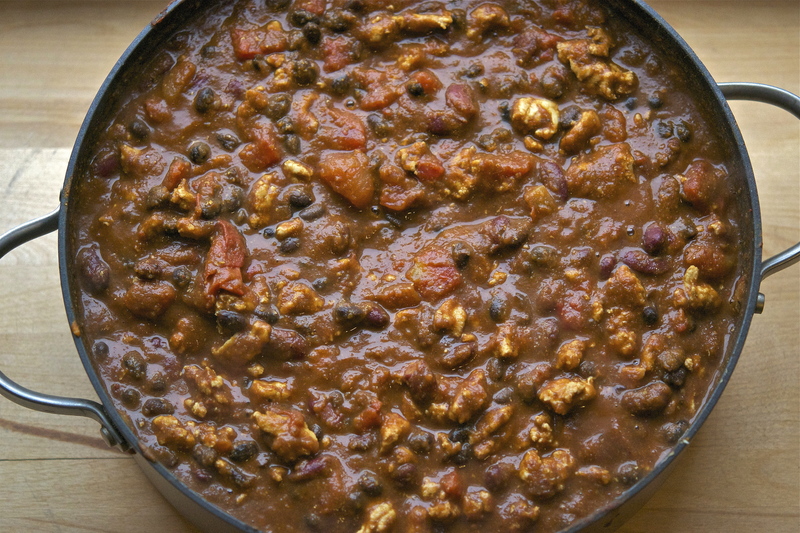 Add the tomatoes, chili paste, black beans, kidney beans, and pumpkin. Stir until combined. Meanwhile, cook the tomato paste in a small skillet until aromatic. Scrape the paste into the turkey mix, and stir until combined. Next, add the spices: cinnamon, curry powder, cumin, turmeric, chili powder, nutmeg. Season with salt and pepper. Transfer the chili to a slow cooker, and add about 1/2 cup of broth – cook on LOW for 6 to 8 hours. (You can also cook the chili in a dutch oven or large stockpot for 2 hours on a stovetop over LOW heat – check periodically to prevent burning). Continue adding stock as needed. Top with avocado and yogurt, and enjoy!